SAN ANTONIO - When a resort hosts a PGA Tour event, it's usually a safe bet it's putting the players on the facility's top golf course. The Westin La Cantera Resort's newer Palmer Course doesn't host the Valero Texas Open, but it's no second fiddle. At the Westin La Cantera Resort in San Antonio's Hill Country, don't be so sure. 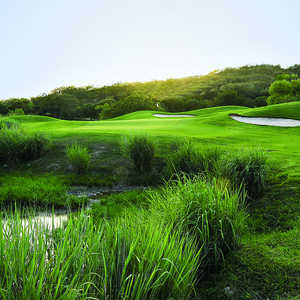 While the pros have teed it up on La Cantera's Resort Course since it opened in 1995, the newer and more dramatic Palmer Course may very well be worth your foursome's first look. The Resort Course hosts the Valero Texas Open each year. 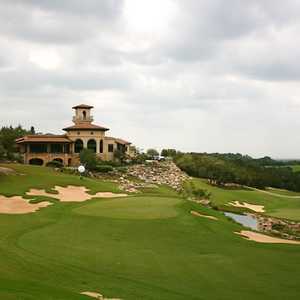 And until the TPC San Antonio and JW Marriott Resort is unveiled next year, La Cantera's two golf courses are the Alamo City's top draw for the traveling golfer. The original Resort Course was designed by the team of Jay Morrish and Tom Weiskopf, and it is most well-known for its photogenically unique roller coaster hole: The par-4 seventh plays next to the Six Flags Fiesta amusement park coaster. At the newer Palmer Course opened in 2001, no such roller coaster views are in play. Instead, you'll feel less in a metropolitan city and more amongst the Texas Hill Country. The course's more dramatic terrain makes for a golf course that's entirely different and probably more challenging compared to the Resort Course. "The Palmer Course can be more difficult than the Resort Course," said Pete Bakunas, assistant golf professional at the Palmer, who notes a lot of golfers will call the resort and initially ask to play the course that hosts the Texas Open. "The elevation changes on the Palmer are more severe than the Resort, and I think it can be a little harder to grasp at first play. "But the Palmer is unlike any other golf course in San Antonio." The 10th hole is the best example of a hole that you'll definitely play better the second time around. The tee shot is straight uphill, with a pole as your only guide. But the pole doesn't foreshadow the firm kicks right the fairway yields, towards the cliffside. It's best to play well left of the pole (especially if you're a left-to-right ball flight). The approach shot is even more knee-knocking, as you'll have to play to a shallow green guarded by the cliffs front and right. While holes like No. 10 and No. 8 offer blind, uphill tee shots that employ white barber shop poles to identify the center of the fairway, on the 18th, something a little more sturdy is your line: the high tower of the clubhouse. Aim straight at it on this long, 490-yard finisher, and if you crack a good drive here, the hole gets a lot shorter fast, as the hole heads steeply downhill towards the green. You could be left with little over 100 yards with a good tee shot or well over 200 yards with a bad one. 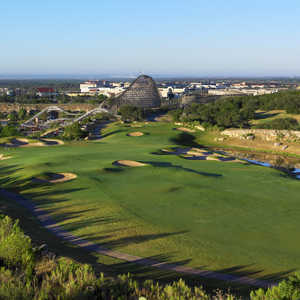 When coming to San Antonio, your initial instincts may be to book the course that hosts the pros at the Texas Open first. But before you do, certainly consider the Palmer Course. If you think the Resort will be the more difficult of the two, think again. The Palmer carries a slope 8 higher than the Resort and a 74.2 rating versus the Resort's 72.5. Along with the scenic vistas, the Palmer features plenty of stone beautification, especially around the ninth and 18th greens, that share a waterfall formation. Facilities at this Troon Golf resort, as is expected with any Westin Resort and Troon-managed property, are top notch, from the course's own 15,000-square-foot clubhouse to a driving range and practice area that is home to a golf academy (range balls are included in the green fee). Golf carts are also equipped with GPS that have a very cool function, especially for group outings: The screen displays a leaderboard with everyone's score at the bottom and can even factor in handicaps, so set up your game accordingly. The Westin La Cantera is in northwest San Antonio, just around the corner from the Six Flags Fiesta Theme Park, which should be a prime location if you're bringing the family along for the trip. The resort is also coming off its own $10 million renovation that upgraded its public facilities and guest rooms. If you want to stay downtown, check out the new Grand Hyatt right on the River Walk. Here, you can be picked up via boat and go on a dinner cruise throughout the city. The 1,003 guest rooms are brand new, spacious and stylish, complete with all the modern amenities like LCD flat screen TVs. Concierge services will also help plan your golf tee times anywhere in the city.